This is my first time making Taiwanese style beef noodle soup, and I was surprised it came out way better than my expectation. The meat is tender, and full of flavors! The secret is the cut of meat– I used boneless beef short ribs chunks instead of the traditionally used beef briskest or beef shank. Beef briskest is hard to cut (and takes forever to cook until tender); beef shank can still, sometimes, be tough after stewing for long time. Put all stew seasoning in a deep pot, cover and bring to a boil on high heat. Continue boiling for another 10 minutes for the flavor to come out. Meanwhile, trim off excess fat from the beef. Rinse well. Cut the meat to bite size pieces, across the grain of meat. Season with 1/2 tbsp of salt. After boiling 10 minutes of boiling the stew, add beef to the stew (be sure the liquid covers the meat). Cover, and boil on high heat for 10 minutes. Then reduce the heat to medium, cook for about 1 hour. Add more water if the stew dries out too quickly. The beef should be tender at this point. While the meat is stewing, boil chicken broth in a separate pot. Set aside. To assemble: place some noodles in a bowl. Arrange some green vegetables and some beef on the top. Scoop over some stew liquid and chicken broth (2 stew liquid : 1 chicken broth). 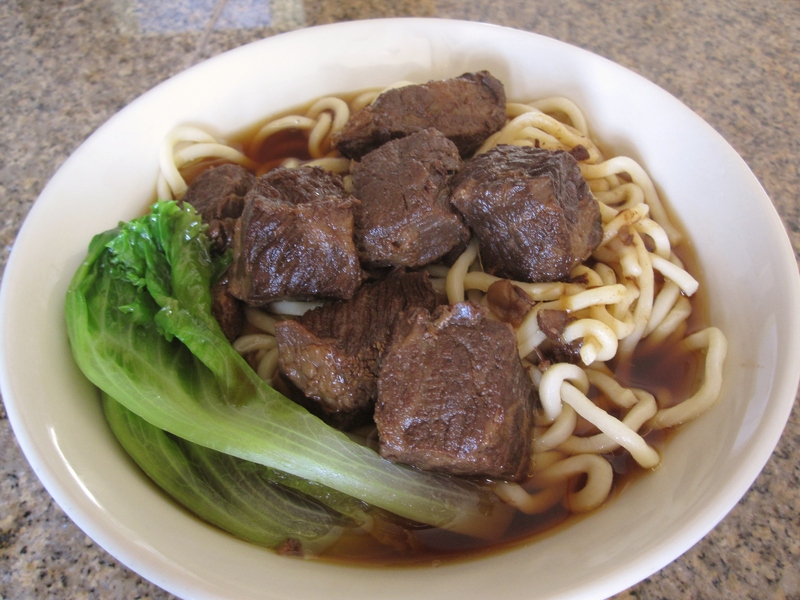 For spicy beef noodles, also add in some chili sauce or chili oil. Boneless beef short rib chunk: this is the meat from beef short rib section but without the bones. It is usually cut into 1– 2 inch stripes and can be found in regular grocery stores. I got mine from Costco. I personally prefer the meat that has marble fat because it’s more tender after cooking, and enhance the flavor. Pickled sour mustard green condiment: this is a typical condiment for Taiwanese beef noodle soup. I skipped it this time because my family doesn’t like it.